Welcome to my Special Order store. It is here that I present those items available for special order. Please contact me for additional information. I have embraced waterborne finishing methods, decreasing personal and environmental exposure to harmful chemicals and assuring you, my customer that your support of my work will not conflict with your commitment to reducing your environmental footprint. Birdseye Maple with Spalted Maple accents. Introducing the third in the series of my cabinet on stand designs. 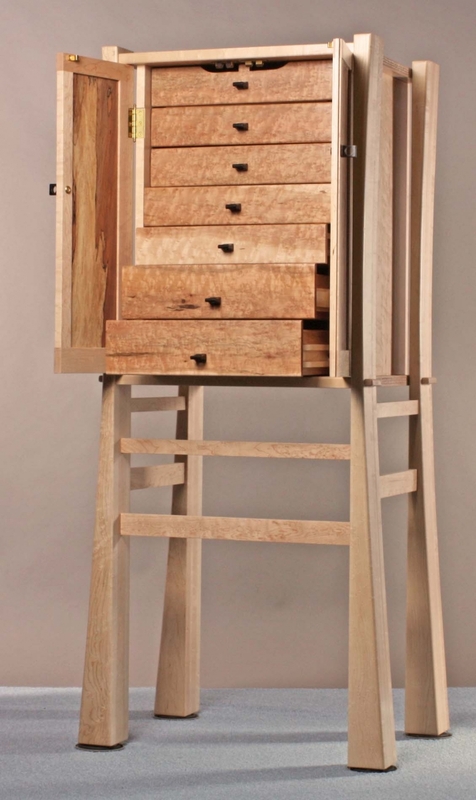 The design for this cabinet follows my particular way of hanging a cabinet within its legs. This cabinet is 22 inches wide by 16 inches deep by 49 inches tall. 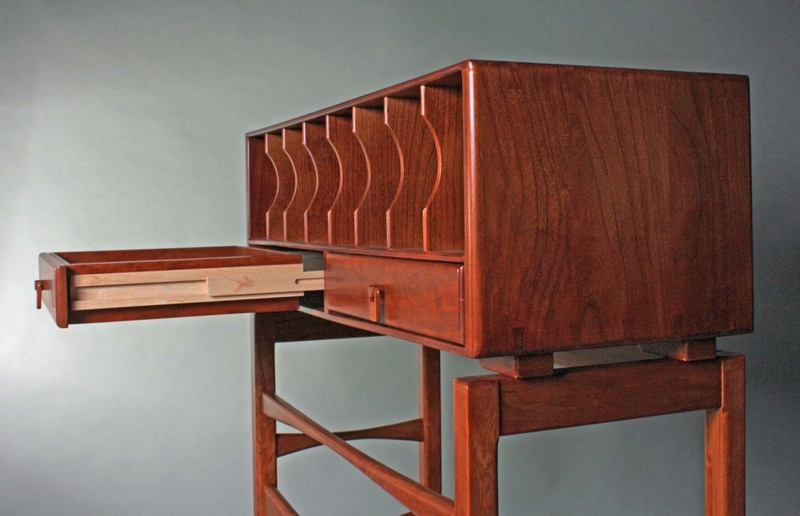 It has a total of seven Cherry drawers which feature hand-cut dovetails and French bottoms. Each drawer is hung from full extension slides that I fashioned entirely from Hard Maple. 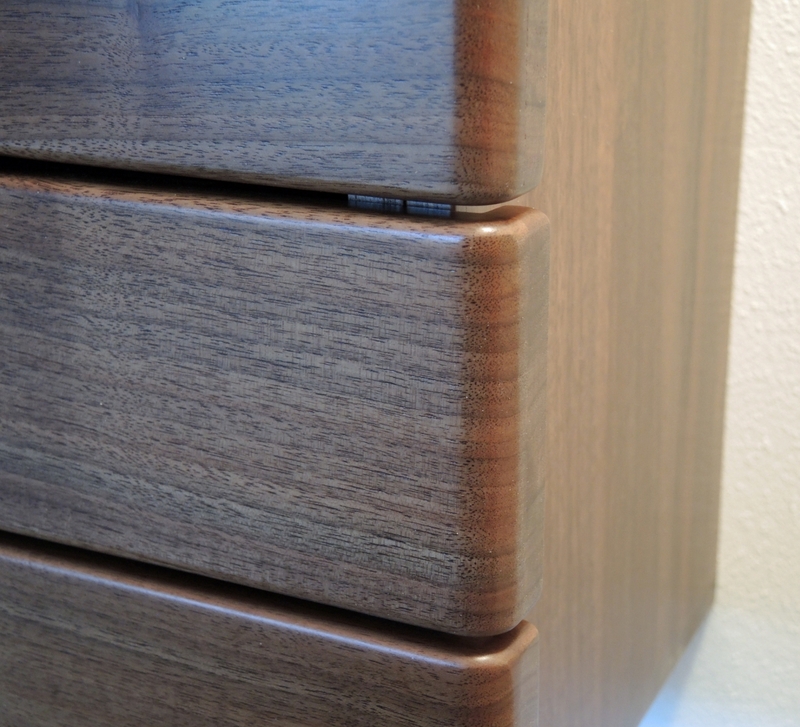 The cabinet is finished with a waterborne polyurethane, a very durable finish. This is a variation of a a previous cabinet in the series. It is the sister to a custom order of similiar design. This cabinet is 30 inches wide by 12 inches deep by 38 inches tall. 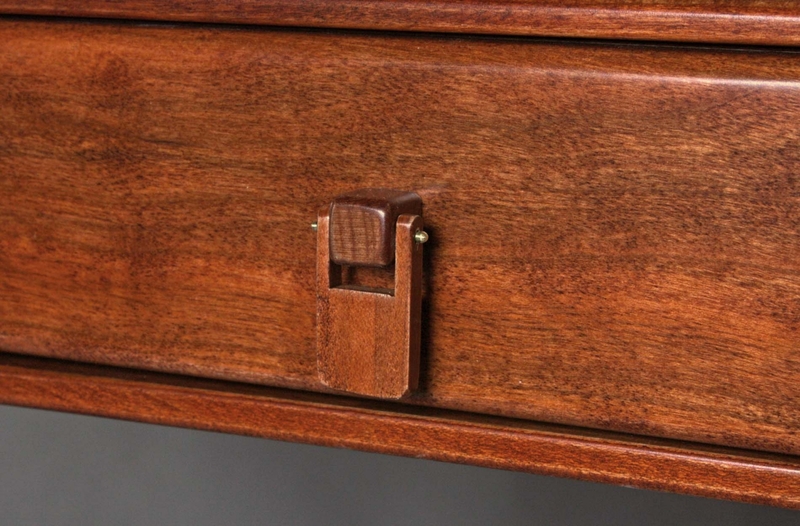 It has two Cherry drawers which feature hand-cut dovetails and French bottoms. Each drawer is hung from full extension slides that I fashioned entirely from Hard Maple. Each drawer may be lifted up off the slide for removal. Each drawer has one of my "Paddle Pull" designs. Two additional pulls are included just in case. Orders Only, $7,000.00 and up. 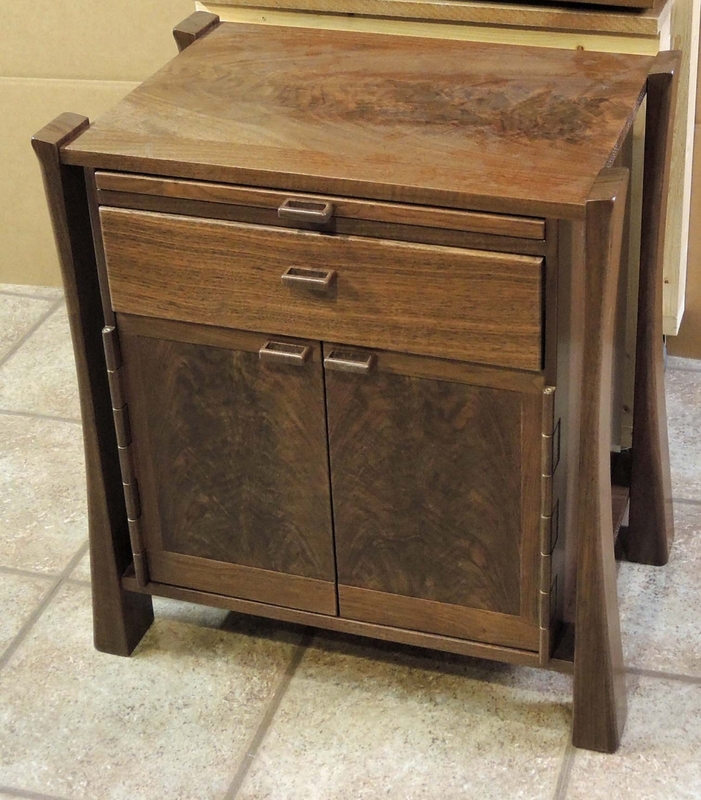 A variation of my cabinet-on-stand design, this nightstand features several new ideas for me. Base and optional wall hung cabinet providing 5 drawers. 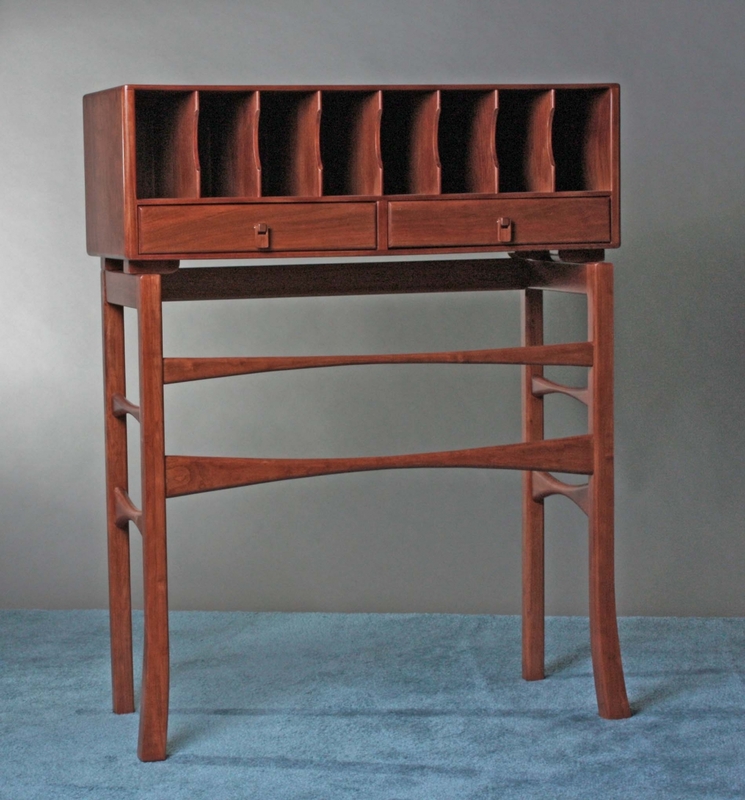 The base cabinet is 26 inches wide by 17 ½ inches deep by 27 ½ inches tall. 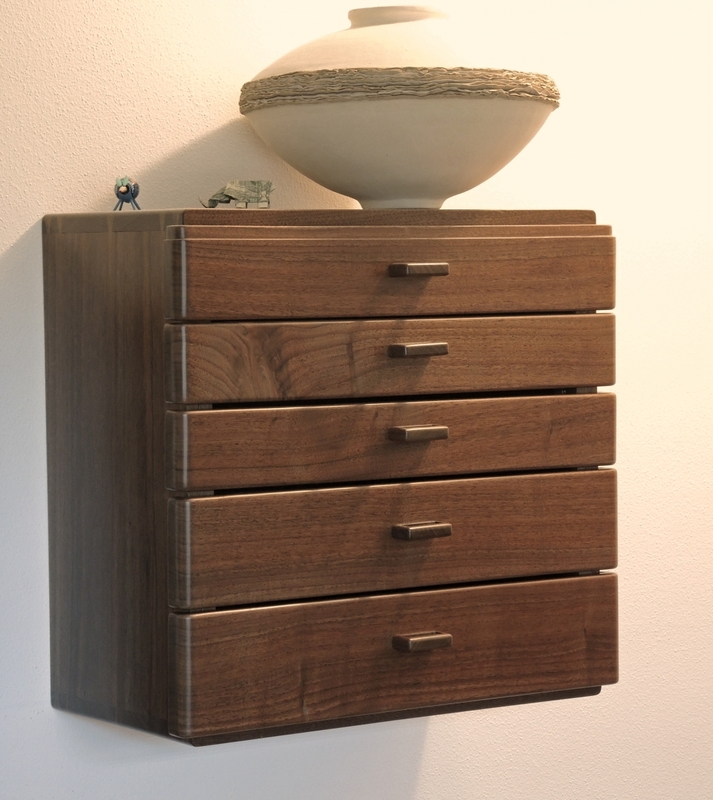 It features pierced rectangular pulls made from walnut. It also has a pull-out tray. Click on picture to see enlarged view. The wall cabinet is 18 inches wide by 10 inches deep by 18 inches tall. It is meant to be attached to the wall above the nightstand. 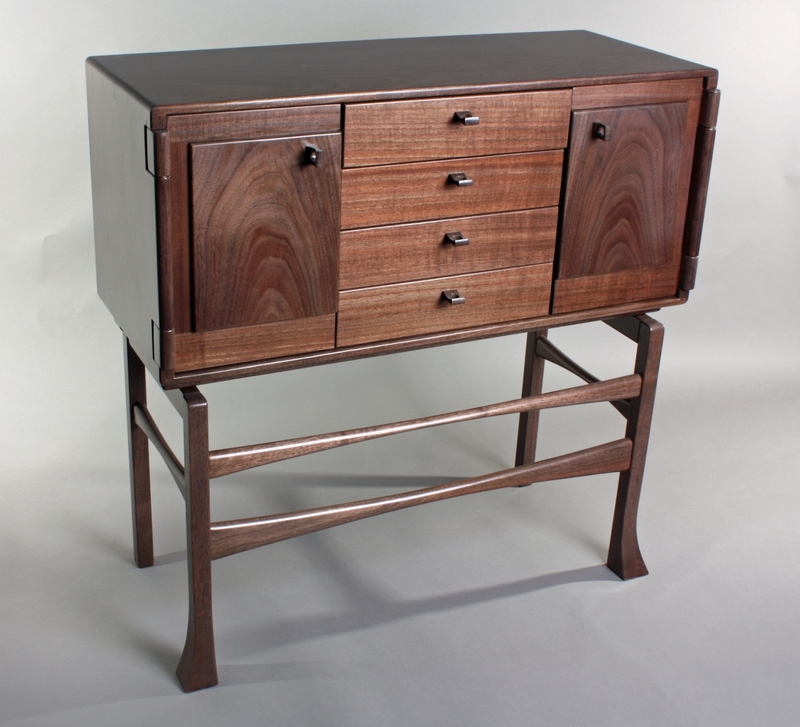 It features pierced pulls made from walnut in addition to the above listed attributes.